Duke Engineering students stand with their prototype heavy-lifting drone after a test flight for the Ocean Discovery XPRIZE competition. "A lot of people who do this sort of work for a living didn't even bother trying to compete," said Martin Brooke, associate professor of electrical and computer engineering at Duke and leader of Duke's team. "Most people viewed this challenge as completely and totally impossible. And they might be right." "Each year there's a bit of a slowdown as the new students come up to speed on the project. But at the same time, they come in with fresh ideas and a lot of energy," said Doug Nowacek, the Randolph K. Repass and Sally-Christine Rodgers University Associate Professor of Conservation Technology in Duke's Nicholas School of the Environment and Pratt School of Engineering. 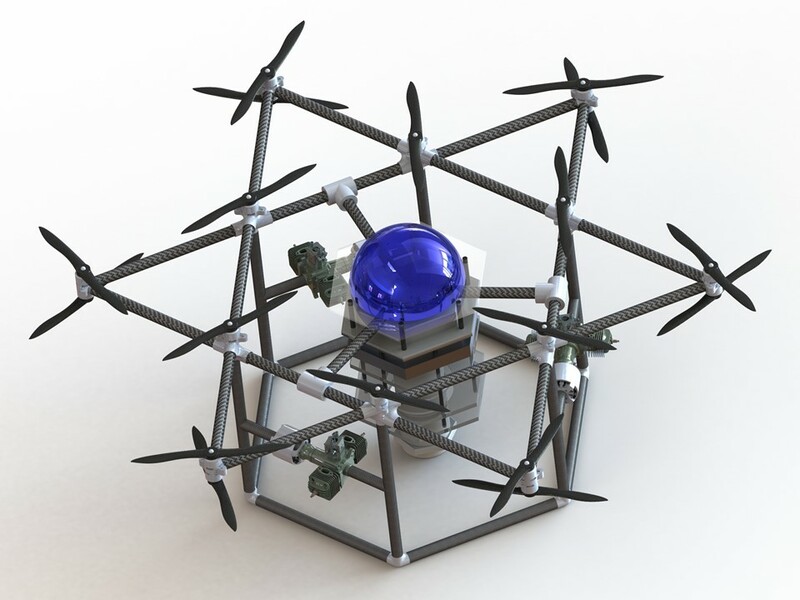 Duke's approach is to use giant heavy-lifting drones to deploy and retrieve a series of sonar-equipped sensors that are lowered from floating platforms at the ocean's surface. This is much more difficult than it sounds. The drones must autonomously navigate gusting winds and waves that average six meters in height while dropping off and retrieving the sensors. The floating sensor platforms must carry at least 3,500 meters of cable to lower and then pull up the sensor pods, making them extremely heavy for the drones to carry. The sensor pods themselves must withstand the pressure, temperature and salinity of the ocean's depths. And to successfully map the area required, the team must deploy multiple drones making multiple drop-offs and pick-ups, and then seamlessly analyze all of the data. "Our goal is to get this project to the point where all the next group of students need to do is build more of the drones and sensors that we've already completed," said William Willis, a junior studying mechanical engineering who plans to continue participating during his senior year. "We want to demonstrate a full cycle of dropping off a sensor, mapping an area and picking it up before graduation in May," added Nick Lockett, a senior studying electrical engineering. "This project has given us a chance to work on electrical engineering problems in a real-world setting," said Krista Opsahl-Ong, also a senior studying electrical engineering. "And I don't mean just from a science perspective. We've had to work with a huge team with a lot of moving parts. It's forced us to segment our work and keep track of a lot of parallel projects. And of course it's been a ton of fun to actually get our hands dirty." The nine finalist teams will be formally recognized and awarded at Oceanology International's Catch the Next Wave conference in London on March 15. Attending the event for the Duke University team will be Brooke and graduating senior Sam Kelly—one of the few undergraduate students who has worked on the project since its inception. The final Round 2 testing will take place during October and November of 2018.